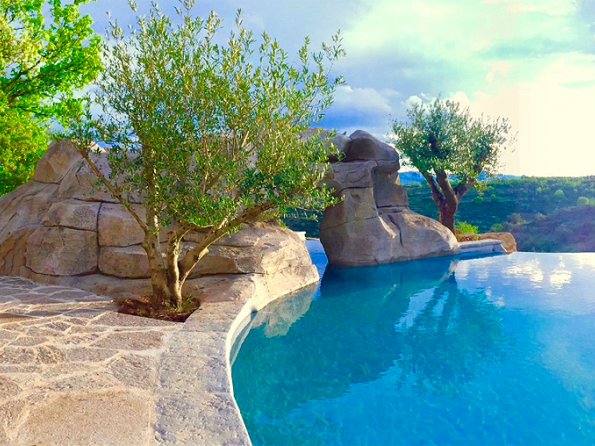 Mountain Retreat for 8 People with Pool & Treehouse in Bedarieux, Languedoc, France258.0000Minimum stay 3 nights20% off first 2 weeks in May! 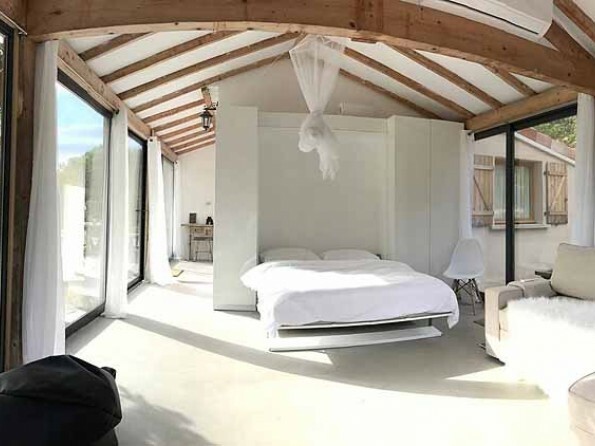 1 Bedroom Eco Casita in Canary Islands, Lanzarote, Arrieta£101140€ Reduction Special Offer! 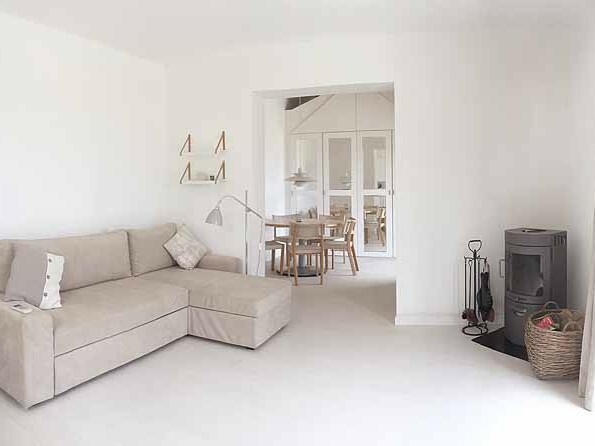 Sat 27 Apr - Sat 4th May & Sat 4th May - Sat 11th May now £2000 for the week (was £2500). 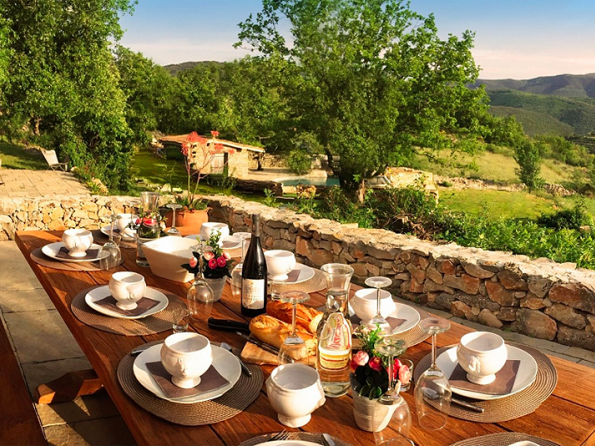 Set in 2 hectares of land on the border of the Languedoc National Park in the south of France, you will find this simply glorious private mountain retreat with breathtaking views all around. 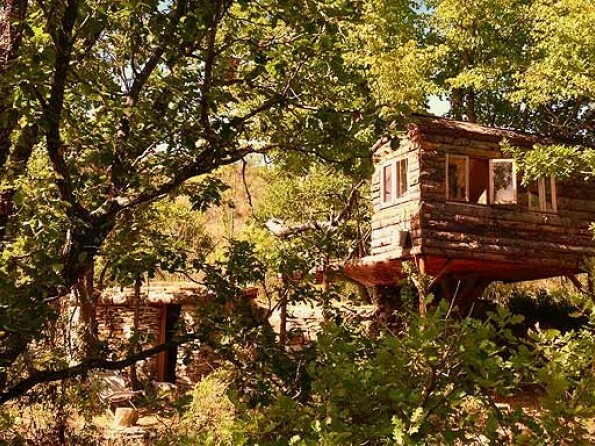 Made up of a main house, guest house, shepherd’s hut and treehouse, it perfectly accommodates a group of friends or family in a luxurious holiday setting. Languedoc runs along the Mediterranean coast of southern France extending right to the Spanish borders. The region has been named ‘Best in Travel’ by Lonely Planet. 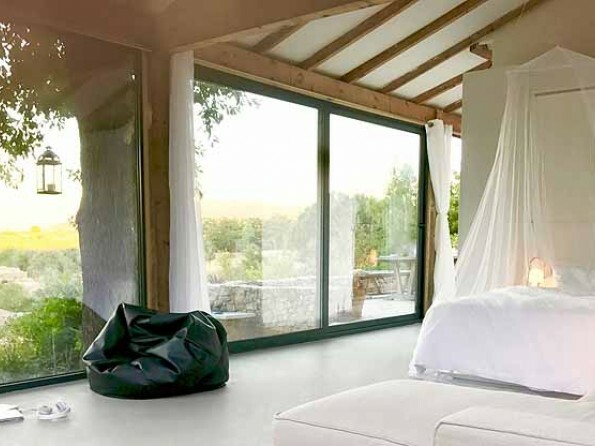 Wild Boar Mountain is in an idyllic setting surrounded by trees, mountains, vineyards, olive orchards and cherry trees. 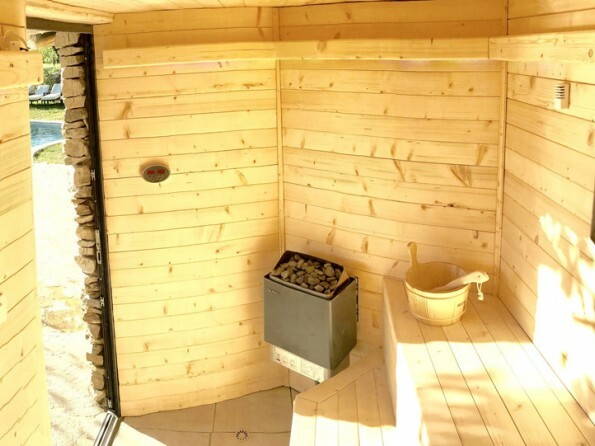 It’s the perfect tonic to busy lives - unwind by the pool, explore the hiking and biking trails from your doorstep, or spend the night in the on site treehouse or stone shepherd’s hut. 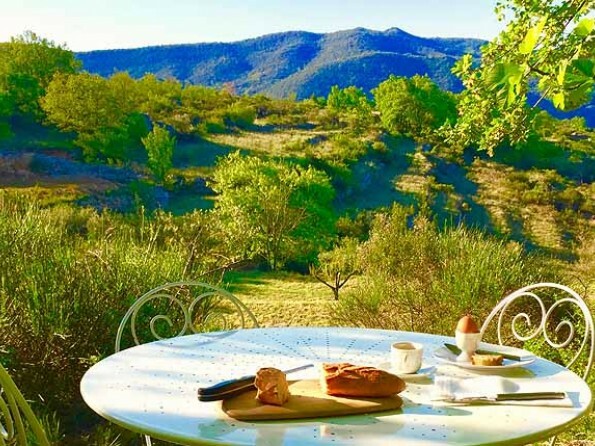 Languedoc Roussillon, named by the Lonely Planet as ‘Best in Travel’, is a wonderful place to explore. There’s lots to do in the vicinity, catering for all requirements. The house itself has a welcome folder with handy maps and places to visit. The town of Bedarieux is a 5 minute drive down the hill from Wild Boar Mountain. The town has a tennis club with indoor pool and sports facilities (and great mountain views! ), a Monday market, and a variety of shops and restaurants. La Voie Verte cycle route is a 5 minute cycle from the house. There is a golf club a 10 minute drive from the house. Within a 20 minute drive you can visit Les Gorges d’Heric, one of the natural wonders of the Languedoc region, wonderful waterfalls and scenery. 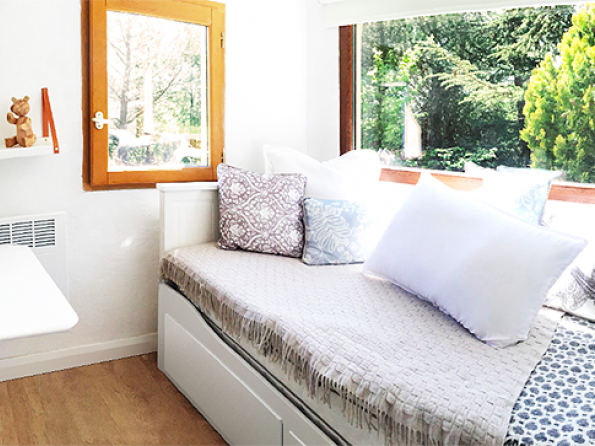 20 minutes drive also gets you to a canoe and white water rafting club, and the beautiful town of Penenas where the medieval streets are filled with artisan shops and art galleries, Friday night markets and wine from local vineyards. Drive for one hour to reach Cap d’Agde with its stunning beach, harbour and water park. 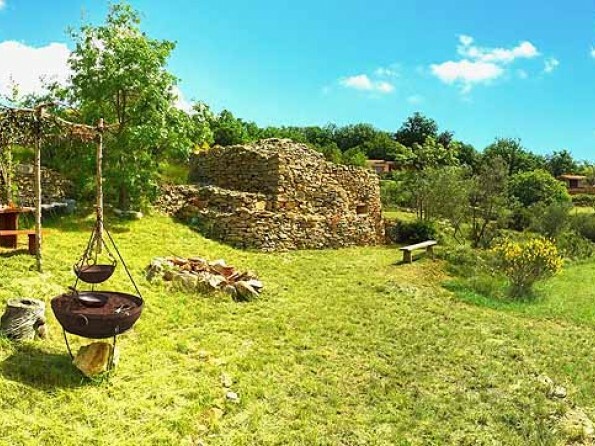 Also nearby fishing, riding, medieval villages, caves; you will not be short of things to do and places to visit! Nearest airports is Béziers Cap d'Agde Airpor and Montpellier airport. 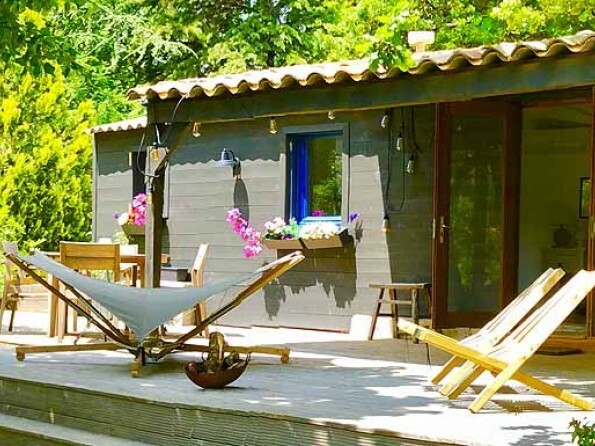 Rent a car on your arrival from the airport and the property is located in Bedarieux, 45 minutes from Beziers airport or 1 1/2 hours from Montpellier airport. A chauffeur service can be arranged to meet you at the airport if required at an extra cost. Bedarieux has a car hire company locally. Bédarieux is 56 km (35 mi) west of Montpellier and 30 km (19 mi) north of Bézier. 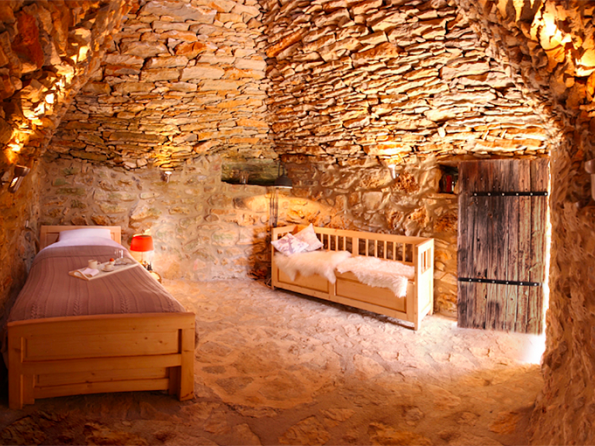 Wild Boar Mountain is made up of two main properties, with two further sleeping options. 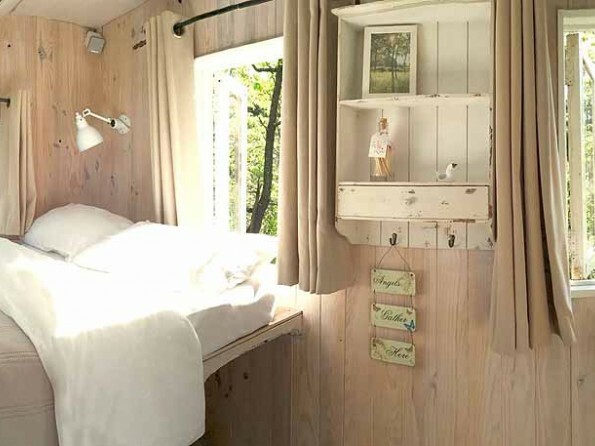 The main house sleeps 4, the guest house sleeps 4, and then there is a treehouse and a stone shepherd’s hut also on site, each sleeping two people. Guests often use the treehouse and shepherd’s hut for a few nights only, or for the youngsters to stay in when they get fed up of the adults! 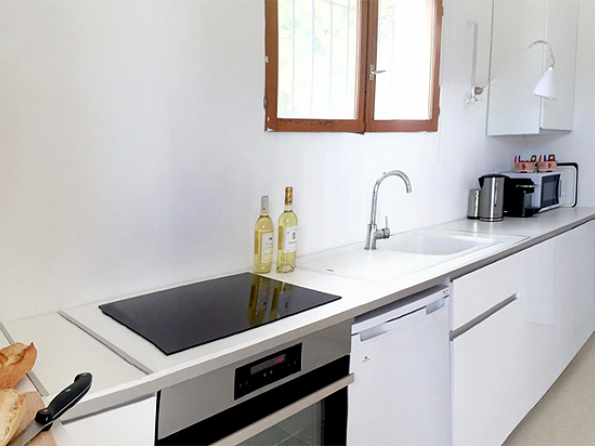 The main properties have a fully equipped kitchen, wood burning stove, pizza oven, indoor dining for up to 8, air conditioning, internet access throughout, satellite TV, CD player, iPod dock and laundry room with washing machine. The main house is a traditional brick built house with a glass extension. The guesthouse is a 20 second walk to your right from the main house's main terrace. As you drive through the electric gates there's a private car park with two spaces. 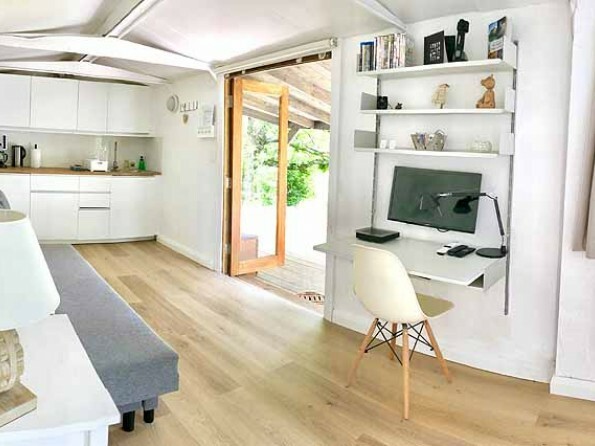 Directly beside the gravelled car park spaces you can walk through to the guest house's wooden terrace, where you access the guest house into the open plan kitchen/ living area with double sofa bed. Or, from the parking spaces, you can follow the gravelled and lit path for about a 30 second walk to the main house. The property is on a terraced slope, the two houses are sat on the top level looking down the valley, the pool is one level below to the left. There are seating areas all around the gardens, all with unique views and relaxing seating options. 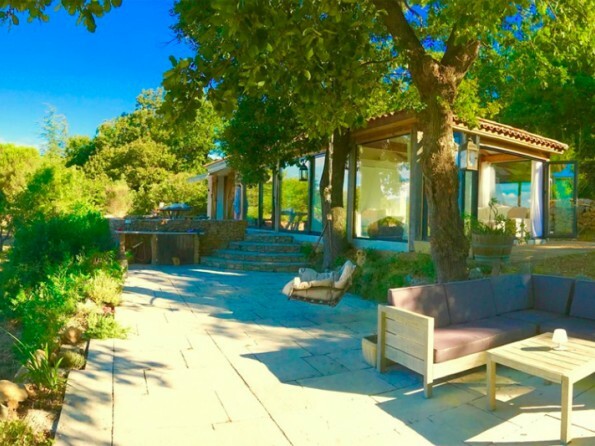 The property is completely private and set in two hectares of land in the mountains, with breathtaking views to the Languedoc National Park. There are many sunny terraces, and shaded areas for afternoon siestas. 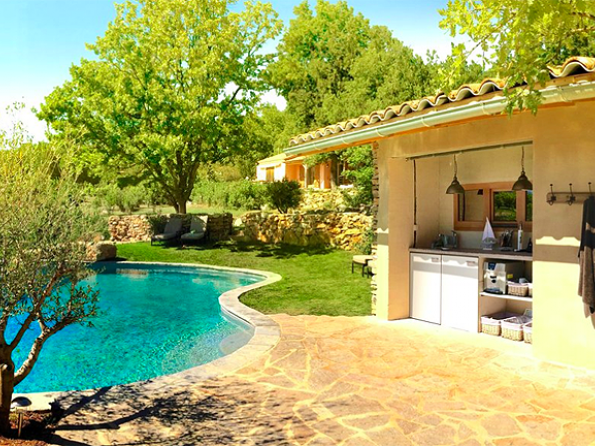 There is a pool house and a terrace with dining table for up to 8 people. The fenced pool is heated during the summer months (can be heated out of season for £200 per week). It is 12m x 6m and is 8 foot deep. There are sun loungers around the pool. 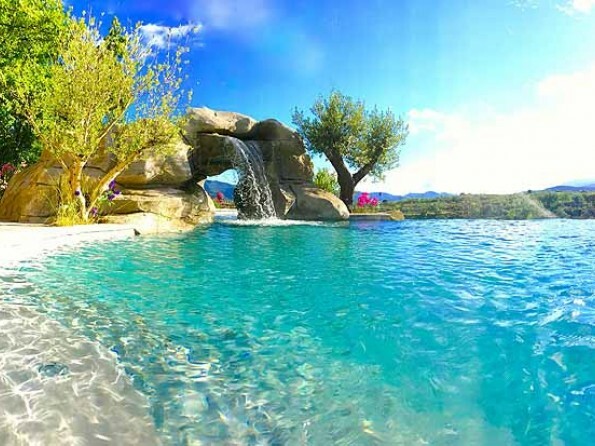 The pool is saltwater (no chlorine) and features a waterfall and a cave. The pool has a sauna next to it as well as a little building with bathroom and outdoor kitchen with fridge and coffee facilities so that you are as comfortable as can be around the pool. There is an english speaking house manager available for all your queries, and a maid service if required. Bike hire available @ £30 per bike per week. Cot / highchair available for £25 per week. All linen, including pool towels provided and changed weekly unless otherwise agreed. 25% deposit on booking and the full payment a 6 weeks before arrival. We also hold a £500 damage security deposit should there be any damage. Booking in the high season is from Saturday to Saturday.